This article is about the county in New York. For other uses, see Chenango (disambiguation). This was long the territory of the Oneida people, one of the first Five Nations of the Iroquois Confederacy or Haudenosaunee. They occupied the area until after the Revolutionary War, when they were forced off the land, although they had been allies of the patriot colonists. They were granted a small reservation, which settlers continued to encroach on. When English colonists organized counties in 1683 in what is now New York, the present Chenango County was part of Albany County. This was an enormous county, including the northern part of New York State as well as all of the present State of Vermont and, in theory, extending westward to the Pacific Ocean. But, territories located to the west of present-day Pennsylvania were under effective French control as part of New France. Albany County was reduced in size on July 3, 1766, by the creation of Cumberland County, and further on March 16, 1770, by the creation of Gloucester County, both containing territory now in Vermont. On March 12, 1772, what was left of Albany County was split into three parts, one remaining under the name Albany County. One of the other pieces, Tryon County, contained the western portion (and thus, since no western boundary was specified, theoretically still extended west to the Pacific). The eastern boundary of Tryon County was approximately five miles west of the present city of Schenectady, and the county included the western part of the Adirondack Mountains and the area west of the West Branch of the Delaware River. The area then designated as Tryon County has since been organized as 37 counties of New York State. The county was named for William Tryon, the British colonial governor of New York. In the years prior to 1776, during the increasing tensions most of the Loyalists in Tryon County fled to Fort Niagara on the Western Frontier. In 1784, following the peace treaty that ended the American Revolutionary War, the Americans renamed Tryon County as Montgomery County in honor of the US general, Richard Montgomery. He had captured several places in Canada and died attempting to capture the city of Quebec. The US residents replaced the name of the former British governor. In 1788 the Oneida Reservation was considerably reduced by what is known as Clinton's Purchase, when land was sold off west of the Unadilla River to create what are now 20 towns. (See map to the right.) Settlers from eastern New York and New England entered the area and started farming. In 1789, Montgomery County was reduced in size by the splitting off of Ontario County. The area split off from Montgomery County was much larger than the present Ontario County, as it included the present Allegany, Cattaraugus, Chautauqua, Erie, Genesee, Livingston, Monroe, Niagara, Orleans, Steuben, Wyoming, Yates, and part of Schuyler and Wayne counties. It was the practice to establish a large geographic county and divide it as settlement increased. In 1791, Herkimer, Otsego and Tioga counties were organized from land separated from Montgomery County. Chenango County was formed on March 15, 1798 from 1,610 square miles (4,170 km2) of Tioga and Herkimer counties. Its eastern border is formed by the Unadilla River. The land had been purchased the year before from the Oneida, who were forced into a smaller reservation to the north. On April 4, 1804, 70 square miles (180 km2) of Chenango County was partitioned to expand Oneida County; the communities of Waterville, and Sangerfield were assigned to the new Oneida County. On March 21, 1806, 650 square miles (1,680 km2) of Chenango County was partitioned to produce Madison County. This established the current borders of Chenango County, which have been maintained to the early 21st century. This area was developed for agriculture in the nineteenth century and is still largely rural. According to the U.S. Census Bureau, the county has a total area of 899 square miles (2,330 km2), of which 894 square miles (2,320 km2) is land and 5.1 square miles (13 km2) (0.6%) is water. Chenango County is in the approximate center of the state, west of Albany, north of Binghamton, and southeast of Syracuse. The county is considered to be in the Southern Tier region of New York State. The Chenango River, a tributary of the Susquehanna River, flows southward through the county. As of the census of 2000, there were 51,401 people, 19,926 households, and 13,549 families residing in the county. The population density was 58 people per square mile (22/km²). There were 23,890 housing units at an average density of 27 per square mile (10/km²). The racial makeup of the county was 97.65% White, 0.82% Black or African American, 0.27% Native American, 0.28% Asian, 0.02% Pacific Islander, 0.22% from other races, and 0.74% from two or more races. 1.07% of the population were Hispanic or Latino of any race. 20.2% were of English, 14.5% German, 13.8% Irish, 12.3% American and 8.9% Italian ancestry according to Census 2000 . 96.7% spoke English and 1.3% Spanish as their first language. There were 19,926 households out of which 32.50% had children under the age of 18 living with them, 53.10% were married couples living together, 9.80% had a female householder with no husband present, and 32.00% were non-families. 26.10% of all households were made up of individuals and 11.40% had someone living alone who was 65 years of age or older. The average household size was 2.52 and the average family size was 3.01. In the county, the population was spread out with 26.20% under the age of 18, 7.00% from 18 to 24, 27.50% from 25 to 44, 24.40% from 45 to 64, and 14.90% who were 65 years of age or older. The median age was 38 years. For every 100 females there were 97.00 males. For every 100 females age 18 and over, there were 94.70 males. The median income for a household in the county was $33,679, and the median income for a family was $39,711. Males had a median income of $30,363 versus $22,429 for females. The per capita income for the county was $16,427. About 10.70% of families and 14.40% of the population were below the poverty line, including 19.50% of those under age 18 and 8.70% of those age 65 or over. Chenango County has a Board of Supervisors that consists of 23 Town/City elected officials, serving as representatives at the County level. The term for each Supervisor is based on the term set by each particular Town. A Supervisor holds office for either two or four years. In 21st-century United States politics, Chenango County is considered a "red" county, where the majority of voters elect national Republican candidates. In 2004, Republican George Bush won by an 11% margin over Democrat John Kerry. For state and congressional offices, voters sometimes elect Democratic candidates. In 2006 both Eliot Spitzer and Hillary Clinton carried it, winning 57% and 54% of the vote for governor and US Senator, respectively. In 2008, John McCain carried Chenango County over Barack Obama in the presidential election by a close margin of 49.59%-48.45% or a difference of 237 votes. In 2010, Democrat Andrew Cuomo for governor, and Democrats Chuck Schumer and Kirsten Gillibrand for the US Senate each carried it. Morrisville State College has a branch in Norwich. Norwich, the county seat, is the only city in Chenango County. In New York, a "town" is a political subdivision (synonymous with township). 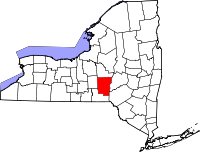 The towns in northern Chenango County originated from the Twenty Townships ceded by the Oneida tribe to the State of New York. Nancy Matthews Elliott was born here in 1810 and became the mother of Thomas Edison. ^ Leip, David. "Dave Leip's Atlas of U.S. Presidential Elections". uselectionatlas.org. Retrieved 2018-10-22. ^ Bacon and Company (1870). Representative and leading men of the Pacific. Bacon and Company. p. 433. NEW YORK: Atlas of Historical County Boundaries; Compiled by Kathryn Ford Thorne; Edited by John H. Long. Wikimedia Commons has media related to Chenango County, New York. Chenango County "Online Visitors Travel Guide"
Chenango Semi-Weekly Telegraph, Google news archive. —PDFs of 2,579 issues, dating from 1877 through 1934.